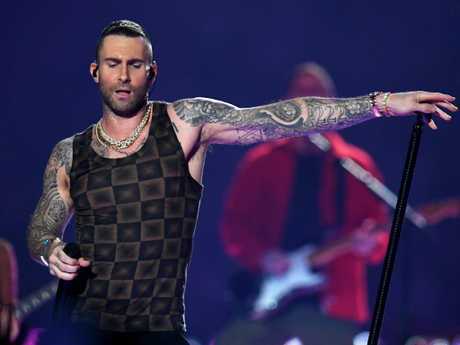 SPONGEBOB SquarePants fans have tasted sweet victory over Maroon 5 over what some Super Bowl commentators have labelled a half time "hoodwink". Fans of the popular cartoon character on Monday voiced their displeasure at the lip service dished out by the American pop group after teasing fans recently with a suggestion they intended to deliver a tribute to the famous sea sponge during their headline performance during Super Bowl LIII. Fans had since November been piling pressure on Maroon 5 to perform a particular SpongeBob cult classic, featured in the cartoon. The movement came after SpongeBob creator Stephen Hillenburg died in November, prompting widespread calls for Maroon 5 to perform the "Sweet Victory" stadium anthem sung by the loveable yellow critter in an episode that centres around the "Bubble Bowl" - the Bikini Bottom universe's version of the Super Bowl. More than 1.1 million fans had signed a petition on change.org calling for Maroon 5 to belt out the same tune in Atlanta's Mercedes Benz Stadium on Monday. It appeared they had got their wish in recent weeks when a report claimed the band included a SpongeBob tribute in their Super Bowl dress rehearsal. It was further teased on Maroon 5's Twitter page. It's why fans were so disappointed when the half time show only featured a brief video tribute to the pineapple-dwelling character as a segue into a mash-up performance with rapper Travis Scott and his heavily censored "Sicko Mode" track. The brief clip showed highlights of SpongeBob belting out his "Sweet Victory" ditty - but it wasn't good enough in the eyes of many fans. It's why it took less than 24 hours for fans to take matters into their own hands. 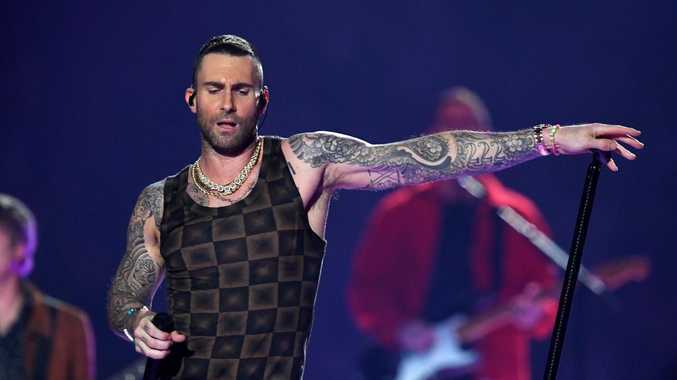 A video emerged on Tuesday morning of an edited video of Maroon 5's half time show performance spliced together with the audio of SpongeBob's "Sweet Victory". The perfect production and cuts from the clip creator have seen it travel around the world. It's hard to deny that it's better than the original. While many fans were overly unimpressed, the Sponge himself was gushingly grateful for Maroon 5's decision to put him in the history books as the first sponge to feature in the Super Bowl half time show. It was just one of many complaints raised by American commentators about Maroon 5's performance. Both lead singer Adam Levine's striptease and the overall failure of the show to hit the high notes of previous performances from Lady Gaga and Beyonce. They performed a total of eight songs before the start of the third quarter - it hasn't stopped some critics labelling the set "boring". The greatest criticism was saved for Levine's striptease and racy ensemble - exactly 15 years after Janet Jackson's infamous wardrobe malfunction. Before stripping down to show off his tattoo collection, Levine launched the band's lacklustre set in a black jacket with a red racer stripe down the front. Underneath: a cubist chemise of sorts, featuring multiple shades of the colour brown. 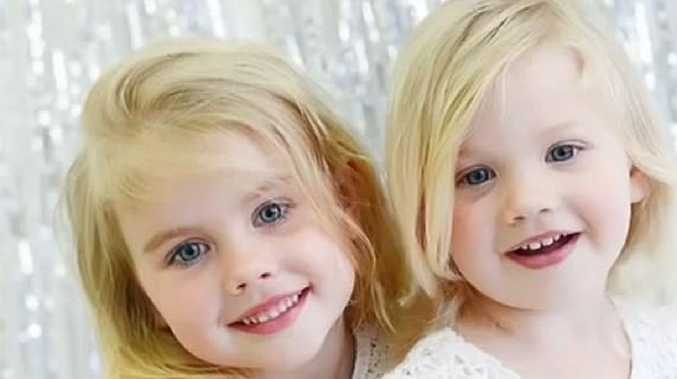 Viewers promptly went wild with fashion critiques upon its reveal, with several twit wits even posting side-by-side photo comparisons declaring Levine's dirt-toned shirt a throwback to drab '70s decor. Morgan Jordal‏ kicked off the Twitter trash talk when she posted an image of a child holding a retro cushion up to their TV screen as Levine did his thing. The tweet has since racked up 27,000 likes and spawned a host of armchair quarterbacks comparing his top to retro pillows, curtains, rugs and, yes, armchairs. 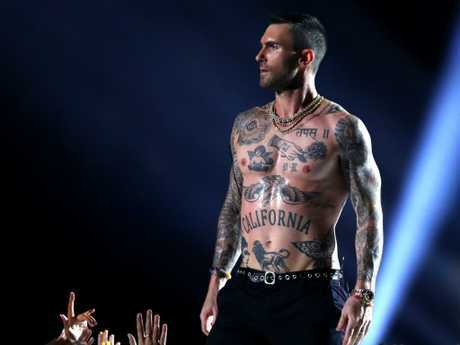 Many Super Bowl watchers, however, were more unimpressed by what Levine wasn't wearing - with some declaring the shirtless last quarter of his halftime performance the sweaty second coming of "Nipplegate."